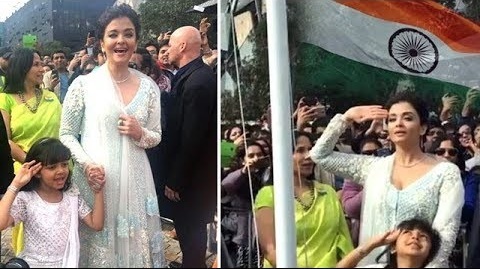 Aishwarya Rai Bachchan along with daughter Aaradhya Bachchan experienced a moment of pride when she became the first Indian actress to hoist the Indian National Flag at the Indian Film Festival of Melbourne (IFFM) 2017.The two of them hoisted the Indian flag in the honor of 70th year of India’s Independence and sang the National Anthem. After flag hoisting, Aishwarya Rai Bachchan thanked everyone for giving such an honor to her. Aishwarya Rai Bachchan was also felicitated with Excellence in Global Cinema Award at this year’s IFFM.